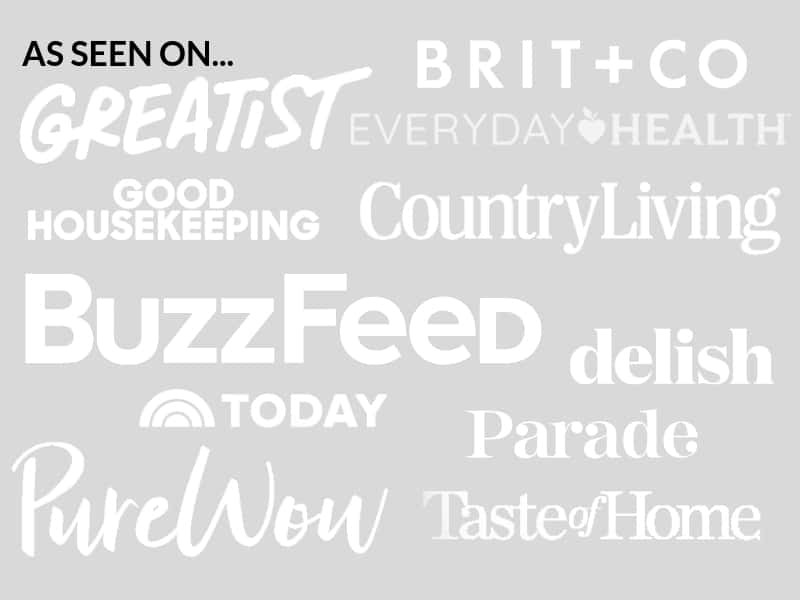 March 21, 2019 By Elizabeth Lindemann 89 Comments / This post may contain affiliate links. 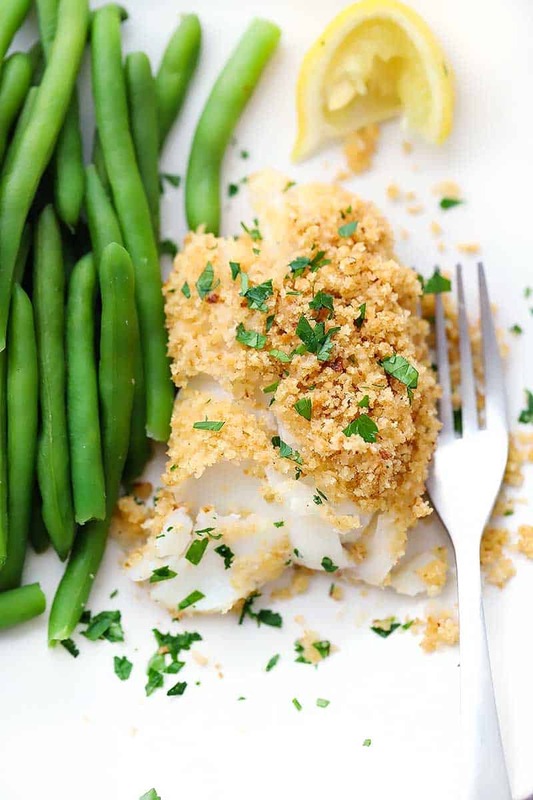 This New England Baked Haddock Recipe is so comforting, delicious, and easy to make! This easy, family-friendly dinner uses only THREE ingredients and requires only FIVE MINUTES of hands on time. If you are from New England, you have had New England Baked Haddock. If you aren’t or haven’t had it… you need to get it in your mouth ASAP. And I mean like, now. 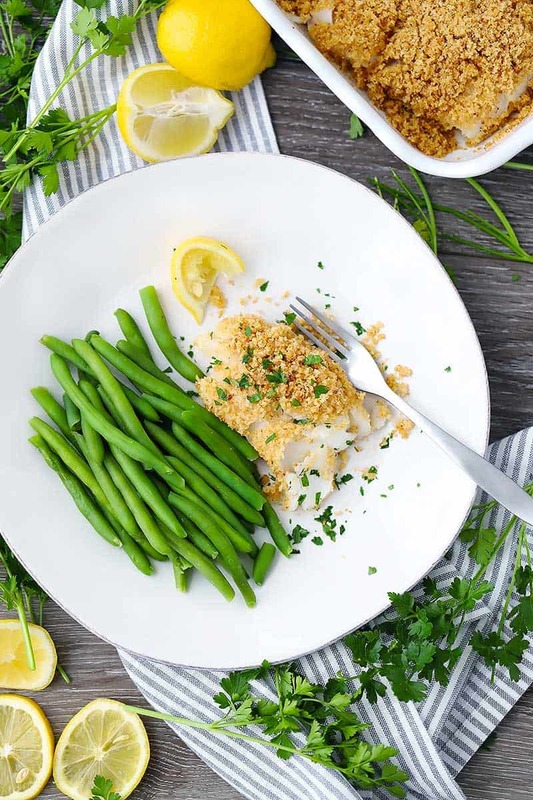 You only need THREE ingredients for this baked haddock recipe: fish, butter, and bread crumbs, plus some salt and pepper. And lemon and parsley, if you want to get a little crazy. This is such a simple and inexpensive meal to make. This is a very traditional dish in New England, and is often served as the fish option at weddings and other shindigs. It can be ordered at almost any seafood restaurant (sometimes, it’s made with cod), and is so melt-in-your-mouth yummy, it will be hard to go back to eating fish any other way! 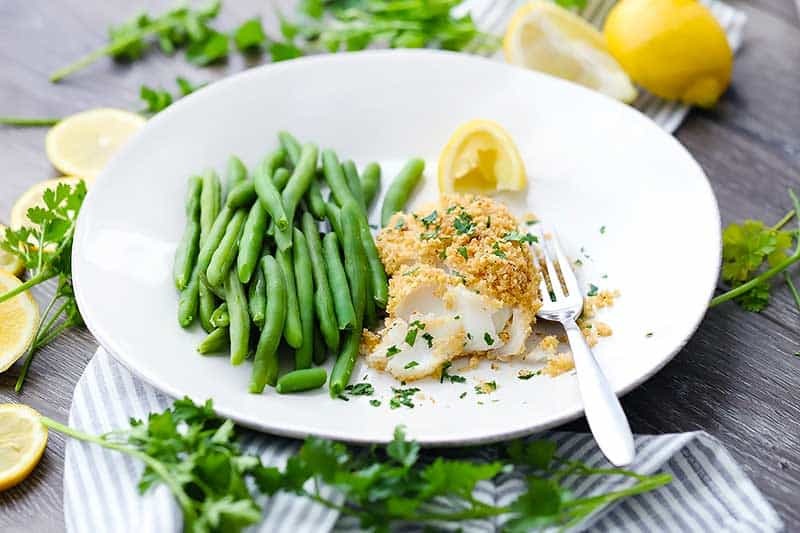 New England baked haddock is perfect for when you want something pescatarian, but a little more soul-satisfying than your average light and healthy fish recipe. It’s almost like fish meets casserole. It’s warm and hearty, and will satisfy even the meat lovingest of the meat lovers as a main course. Traditionally, New England baked haddock is made using Ritz crackers (which are, incidentally, from New England) crumbled up with butter and spread on top of the fish, then baked in the oven with lemon and herbs. Delicious. However, you can get the same delicious effect by using breadcrumbs and lots of butter (to get that awesome buttery Ritz-y taste). I prefer using breadcrumbs instead of Ritz crackers. Here’s why. For one thing, they’re already broken up, so you don’t have to worry about that extra step of smashing the Ritz crackers into crumbles. Just pour the breadcrumbs in a bowl, add some butter, and mix together. For another thing, breadcrumbs are a little more flexible. You can easily make your own out of scratch-made or fresh bread, which means you’ll be more in control of the ingredients in the bread. And there are so many kinds of breadcrumbs out there, including gluten-free or whole wheat versions, so it’s a great way to meet certain dietary needs easily. That said, please feel free to use Ritz crackers, or another similar buttery cracker, in place of the breadcrumbs! Just crush them up (you can use a rolling pin to crush them in a zip-top bag) and add a little less butter than the recipe calls for with breadcrumbs. What else can I add to the breadcrumb topping? This recipe is SUPER basic- only three ingredients. You can add herbs, garlic (powder or fresh), and other seasonings to the breadcrumb mixture if you want! Or you can season the fish with more than salt and pepper. I think Italian seasoning or lemon pepper would be great. My store doesn’t carry haddock! What can I use instead? Now that I live in Texas, it’s hard for me to find haddock at the store. If you can’t find it, or if you just don’t like it, you can use any other mild white fish, such as tilapia, cod, pollock, flounder, or halibut. I’ve even gotten super Southern on this and used catfish- it was great! New England baked haddock recipe is one of the most delicious fish dishes you will ever have, yet it is so simple! With only three ingredients and 5 minutes of hands-on time, you will have an elegant, crowd-pleasing meal. Put a spoonful of the melted butter in a baking sheet or dish and spread to coat the bottom. Combine the bread crumbs (1 cup) with the rest of the 6 tablespoons of melted butter. Salt and pepper both sides of the fish liberally, and lay in the buttered baking dish. Bake for 15 minutes, or until fish is cooked thoroughly (and flakes easily). Serve with a squeeze of lemon juice and a garnish of fresh parsley, if desired. New England Baked Haddock is traditionally made with crushed Ritz crackers. You can use them if you prefer- just put them in a zip-top bag and use a rolling pin to crush them. Then, use in place of the breadcrumbs in the recipe and use only 3 tablespoons of melted butter instead of 6. 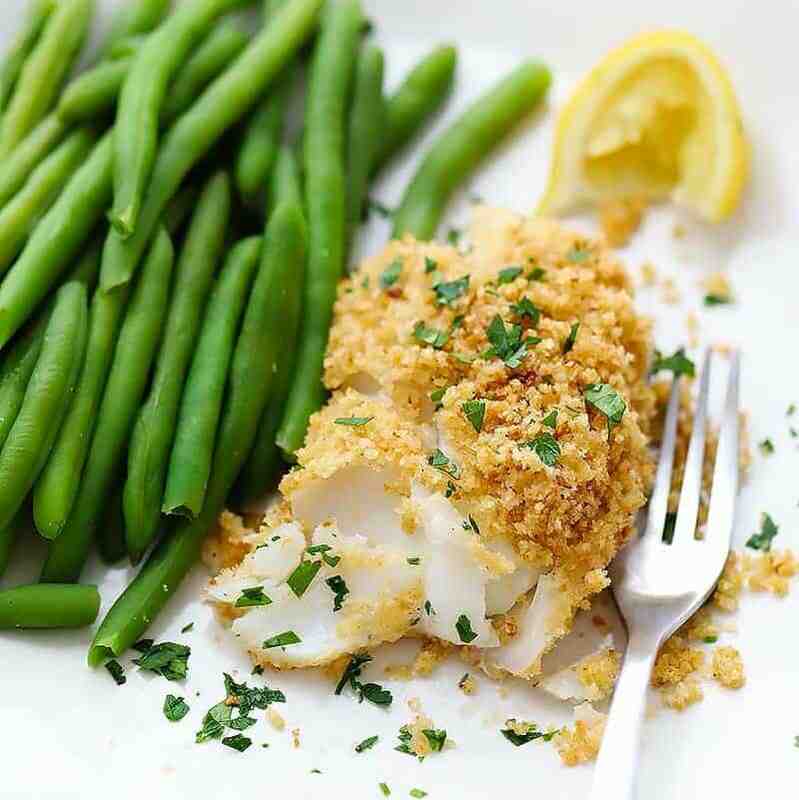 This New England Baked Haddock recipe first appeared on Bowl of Delicious in September 2014. I’ve updated it to include a video, updated tips and tricks, and clearer instructions. Former New Englander here, now hailing from north-ish Georgia. I submitted a comment last night and then realized I hadn’t rated the recipe! Oops. – I used half Trader Joe’s “ritz” cracker crumbs and half whole wheat breadcrumbs. Also added a sprinkle of sage to the topping. 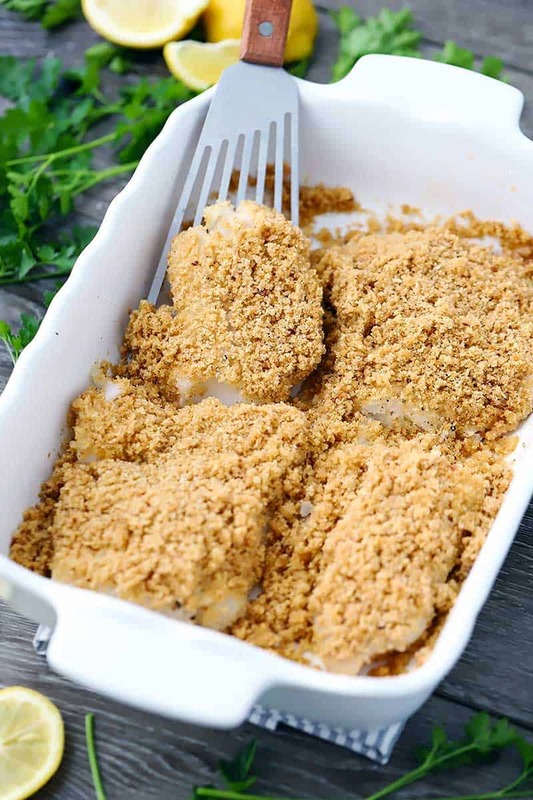 – I sautéed some chopped onions and added a dash of sherry, then spread the onions in the bottom of the baking dish, layering the fish and crumbs on top. YUMMY. Served with cauliflower purée and green beans. SO good!! Thank you so much for posting this recipe! New Englander at heart, posting from our new home in Georgia. I tried this recipe tonight and it was absolutely fabulous. I did half Trader Joe’s “ritz” cracker crumbs and half whole wheat breadcrumbs (I also snuck just a smidgen of sage in with the crumbs), and also sautéed some onions with a bit of sherry wine and spread that in the baking dish first, layering the fish on top. Then proceeded as instructed. Served with a mashed potato/cauliflower mix and green beans. Soooo yummy! Only thing I might do differently next time is use unsalted butter, because yes – with even just half the crackers, it ended up pretty salty. For a keto friendly version use crushed pork rinds instead of bread/cracker crumbs. Ahhhhhh-mazing!!! A New Englander here. Never made it this way but I am going to try it tonight. I will sprinkle it with Lemon Pepper and salt and then the Ritz cracker mixture. Hope you liked it! Love the idea of adding lemon pepper. Haddock filets placed on a buttered baker or cookie sheet. The thin tail end could be tucked under. Top it all with a spattering of sliced almonds, then bake about 20 mins. @ 375. Let the dish sit a couple minutes before serving, so it holds together nicely. Here’s a hint: Put the Ritz in a Ziploc bag and crush them with a rolling pin. Pour the melted butter and the rest of the crumb ingredients over the crumbs in the bag, reseal and kneed it til it’s mixed thoroughly. The crumb mixture goes right from the bag to the fish…easy cleanup!! I have used Worcestershire too, and that’s very good! I’ve mixed Panko with the Ritz – nice crunch. I have used the above recipe, but in addition, I placed the fish over a little heavy cream in the pan, and that adds a nice little bit of decadence. My gang went haddock fishing yesterday!! I find that letting the very fresh, uncooked, filets sit in the fridge for one or two days improves the flavor and the texture of the finished product…really! Newburyport’s my hometown! Love it there. I wonder if I ever went to your restaurant. Thanks for the tip about tucking the tail end under- I’ve never tried it and am always disappointed when the fish doesn’t cook evenly. Genius! And the Swiss cheese idea- YUM! Can’t wait to try. I’m from Newburyport, too (and I’m an Elizabeth also!). Living in Salisbury now. Would you believe that, at age 43, I’ve never cooked fish?? It’s time to try, especially since my kids love fish at their grandparents. So I Googled baked haddock, and your recipe is one of the first that came up — and it looks super easy and appealing. And the fact that you are from Newburyport too obviously means it’s meant to be! Oh wow! What a small world! I really hope you like the recipe- this is a really super easy one for a first fish recipe. I’ve been trying to cook more fish myself lately. It’s hard to find Haddock in Texas, and this recipe just isn’t the same without it, but tilapia is pretty good too! Made this last night for my family and my dad while my mom was out of town. She texted to see if I wanted her fish recipe — and it was almost the same as yours! I made yours and it came out absolutely fantastic. My kids (2 and 3) ate as much as the grown-ups did! Super easy and delicious. Even my anti-fish husband said I’ve converted him! This will be a staple on our menu from now on! Thank you! Aw, I’m SO happy you and your family liked it! It’s one of my faves- comfort food, for sure. Thanks for the comment! Our family loved this recipe with the Swiss cheese. We also added the garlic powder, honey and parsley as recommended. My husband said this recipe was a keeper! Oh yum, I love the idea of adding swiss cheese! Thanks for the suggestion and for the comment- glad you liked it! Rite Aid (soon to be Walgreens) carries these crackers. You are so right about the ritz crackers and the questionable ingredients. Using the whole wheat breadcrumbs is brilliant but if you want to use the cracker crumbs you can buy Late July brand crackers they are organic and have none of the bad ingredients. Thanks for the recipe so good! Thanks for the tip, I’ll have to try the Late July brand! 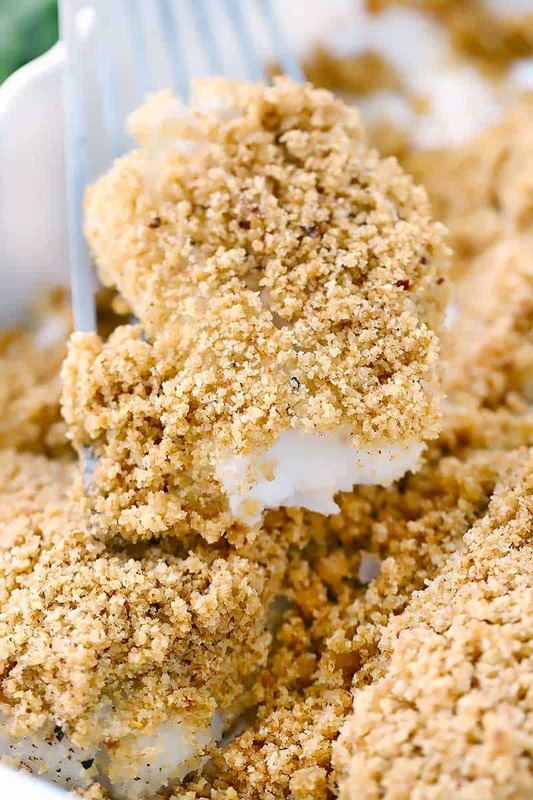 I wrote this post before having kids, and now that I have them, homemade bread crumbs all of a sudden seem like so much work… :-) Glad you liked the recipe! I grew up in Rhode Island, the ocean state. As you can imagine we’ve had a lot of great seafood here. This recipe was so easy and delicious ! My husband is very picky when it comes to how his fish is prepared. I must say he loved it! I will be making this again! Great recipe! Yup, I’d only had it with ritz crackers as well before I made this recipe! I grew up in Newburyport- we were practically neighbors :-) I explained why I used bread crumbs extensively in the post above. Adding lots of butter to them gives them that rich buttery taste, but gives you the flexibility to use whole grain bread crumbs if you want and also decreases the amount of additives and processed ingredients in Ritz crackers. Don’t get me wrong- I love the taste of the Ritz cracker version! But this is a great way to get a very similar taste and texture and make the recipe a bit more wholesome. I used olive oil instead of butter , turned out great! Thanks for the delicious inspiration ! I grew up in Needham, Ma and moved to Maine when I was 18. My Mother always baked Haddock with Ritz crackers and have been doing it that way all my life. 78 yrs old. Moved to Nm in 2011, but go back home to visit my Son every 6 months. We are in Kittery, ME, so get my seafood fresh off the boat. I bring it back to NM. Last night fried scallops, tonight baked Haddock and tomorrow chowda. While in Kittery, went to Bob’s Clam Hut, several times. Anyone passing thru Kittery, Bob’s is the place to go. I grew up going to Kittery all the time! Love the shopping AND the food :-) Bob’s clam hut is awesome, and the last couple times I was there we discovered AJ’s Wood Grilled Pizza- also delicious! I live in Charleston SC, but originally from Massachusetts. Usually use gluten free crumbs, but have to make this recipe tonight. Took me back to my New England roots. According to the recipe for “Cape Cod Baked Haddock with Mornay Sauce” in the book “In the Kennedy Kitchen” by Neil Connolly, the chef at the Kennedy compound in Hyannis Port used Ritz crackers. 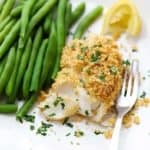 Using ritz crackers is definitely the traditional way of making New England baked haddock- I only use bread crumbs because the ingredients are a bit less processed and you can use whole grains :) thanks for the info!! You are welcome, and I should make it clear that the author Neil Connolly was the chef at the Kennedy compound. I’ve been trying to include more fish in each week’s menus here (Ohio), to cut ‘way back on meat, and to follow the advice of nutritionists I read in newspapers and magazines. A local store offered haddock at a nice price the other day, and I bought it to made baked haddock. And then I found this “New England” recipe…..thank you. Despite the derogatory remark of one of the posters, I’m going to make the ‘traditional’ version, and I have full confidence The Old Man is going to eat it with pleasure! can you please recommend sides with your recipe? I am planning to try it this weekend. This sounds delicious. We also top our with Ritz Garlic and Butter flavored cracker with melted butter mixed in. Oh my Yum. Tonight, it’s what’s for dinner! Im near Portland Maine and love this recipe! I love Portland! One of my favorite towns :-) Glad you like the recipe! Native New Englander here; however, hubby and I have been living in FL since 1993. We really, really miss the northern seafood and try to eat our fill when we’re up visiting the kids and grandkids in the summer. Haddock happened to be on sale at Publix this week and since most of my fish recipes have to do with salmon (our default fish in FL!! ), decided to “let my fingers do the walking” on Google…….SURPRISE, came across your website and its New England roots! Love the simplicity AND deliciousness of this recipe ~ it’s a keeper!!! Aw, I’m so glad that you liked this recipe so much and that it helped bring back memories of New England seafood (which, in my opinion, can’t be beat!). Since writing this post I’ve moved to Texas, and constantly make this when I’m feeling in a “New England” mood. It’s hard to find haddock here so I usually use catfish, and it’s still pretty darn tasty! I made this very delicious baked haddock recipe this week and both my husband and I just loved it. Thank you for a delicious dinner option. My son lives in New Hampshire and I am going to make it for him and his family next time we visit. Yum! I stocked up on haddock while it was on sale. Might have to try this. Last Wednesday, I visited the Market Basket store in South Attleboro, MA. Across from the seafood counter there was a kiosk set up at which all of the ingredients in the following recipe were sold. The recipe itself was available as a photocopy. It appears to have an error, because it refers to breadcrumbs in the text that follows the directions, but breadcrumbs are not mentioned in the list of ingredients. I share the doubts expressed here about Ritz crackers, but would like to bring to your attention the chopped fresh flat leaf parsley, the Rembrandt Aged Gouda cheese, and the garlic powder. Market basket was selling both garlic powder and garlic butter. Free samples of the results were offered at the counter. I am not a skilled cook, but I bought the ingredients, followed the directions, and was pleasantly surprised at how my results matched the samples at the kiosk. I used 1/3 of the ingredients shown below, and did the baking in a Pillivuyt rectangular baker that I bought after I got tired of several decades of improvising bakers out of folded heavy-duty aluminum foil. 1. Preheat the oven to 400 degrees [F]. 2. Mix all ingredients together in a bowl except for the butter and fish. Use a food processor or your hands to make an evenly consistent bowl of crumbs. 3. Place the fish in a cooking dish(es), cover with a good handful of crumbs and sprinkle with drawn butter. 4. Place two tablespoons of water around the bottom of the fish. 5. Bake for 10 to 14 minutes, until the breadcrumbs become brown. Sprinkle more grated cheese on fish just before removing from oven. This is a traditional New English classic made with the perfect combination of fresh bread crumbs and Ritz crackers for the topping. A little bit of Gouda adds a great flavor and you wouldn’t even be able to guess that it’s there……..it just doesn’t get any better than this. The Ritz keep the topping crunchy and the fish is sweet, savory and oh, sooo delicious. This recipe is the secret combination of how it’s done in the restaurants…..In New England that is. Enjoy! Truly amazing. This is the best haddock recipe I’ve ever used. You can bet I’ll definitely use it every time!!! Jesus loves you! I am a New Englandee and have never made this, and I’m not sure why! This was Soooo good! I used club crackers because that’s what I had on hand. It was a huge hit for my family. Thank you for this recipe! This is a winner for my husband and I. Quick, delicious, and satisfying. I sub organic spelt bread crumbs for the whole wheat, otherwise follow your recipe. Great meal! Thanks for posting. Oh my goodness. Wow. That sounds AMAZING and delicious!! I never thought about using buttery bread crumbs with shellfish like this. Please let me know how it turns out! As far as the wine, I have to admit… while I consider myself to have a refined palate when it comes to food (and coffee), I don’t for wine. I’m more of a “pick up something inexpensive with a pretty label” kind of girl, especially when it comes to whites. Alas, I have no suggestions for you. But this article might help! Yes! I live in NH on a street where all the old fisherman at the nearby harbor swore by this exact recipe, with one addition. Worcestershire sauce! A little gives it that little uptaste, a lot is for those who like the zing. By measure, I mean 1/2 teaspoon to 1T. You can taste the result and adjust prior to putting mixture on top of the fish. To your taste, with the goal to wake up the Ritz and butter, but not so much to overwhelm it. We who think us purists swear by Ritz, but using the Worcestershire gives more room to substitute other breadcrumbs. Cautions about salt: 1) melt don’t fry the butter or it will get too salty. 2) Ritz salted has just the right amount of salt for this without any other seasoning except the Worcestershire (and the lemon wedges served on the plate). If using unsalted Ritz or other crumbs, you may wish to add in some salt to your mixture. Happy Pescatoring! P.S. Trick to add young fish lovers. The first time, serve equal parts fish, all Ritz mixture on top, and no Worcestersire. Gradually change the ratio and add W! Good luck. Wow, awesome suggestions! Love the idea of adding Worcestershire sauce, and thanks for all the advice about salt and feeding kids! I was actually born in NH and lived there until I was 5- still one of my favorite, if not my most favorite, states. The White Mountains are one of my favorite places in the world. Liz! I am in central NY and I love seafood. This recipie is the cats pajamas. I used pinko andBandia perfect seasoning then squeezed out some lemon juice after the fish was on the plate. I am headed to Stans Seafood for more haddock. I tried the pollock but it was too blah tasting no matter how I seasoned it” sea bass is the best. Many thanks Phil. We’re in Old England, ie the UK. I thought I was defrosting haddock and it turned out to be sea bass. It was delicious. I roasted a few vegetables at the same time. Such an easy recipe and yet so tasty and looks splendid when you put it on the table! Used haddock, melted butter with a half teaspoon of herbs de provance, panko bread crumbs, salt and pepper with a splash of lemon juice once it was plated. This was absolutely delicious.. So glad you liked it! Love the idea of adding herbs de provance… Yum! Nice recipe, Elizabeth. We’re also New Englanders, in CT, and I was searching for the perfect recipe to make this exact thing. As I’m celiac, it’s in the oven now with GF bread crumbs, but I’m thinking it’ll be perfect. Going to serve it with brown rice couscous with italian seasoning and garden tomatoes of several sorts. It’s hot and muggy today and this will be perfect. Thank you! That sounds delicious, Jeanne! I’ve recently transplanted myself to Austin, TX and I’m happy to hear that it is also hot and humid in New England right now and I’m not missing any fabulous summer weather :) hope you enjoy the recipe! Wow! I was born in Chelsea, MA and was reared in North Cambridge. We had our modest family boat at moor in the Charles River but caught all our fish at sea and ate it when we got home. I now live in central North Carolina and fresh comes around once in awhile at the farmers’s market. So very happy to get your recipe. Just Saturday, I purchased fresh from our coast flounder fillets. Tonight’s dinner, yay! My Mom and Dad where scuba divers in the early 60’s-Jacques Cousteau days. It was such an adventure for young school age kids. We thought this was the world that’s all, including, hanging out with a brown cow whale (baby) that was bigger than our boat and spouting off as we left off Province Town Harbor to return to the locks of the Charles River. Delicious!!! I am also from New England (actually live right near you in Lynn), and this is the easiest version of this recipe I’ve ever tried … and still had the perfect flavor profile. I used seasoned whole wheat panko, since I didn’t have any bread in the house, and it was perfect. Thanks for the recipe! I grew up in Lynn and this i show my mother made it. I miss haddock!! (no haddock to be found in Califonria! No haddock in Texas either! I use cod, bass, catfish or tilapia for this sometimes instead. Yay for New England! I see you live in Salem… we’re in Medfield, MA! Not too far away. This haddock sounds great, and I love your “healthified” version. Hey, neighbor! :-) Thanks so much! I am also a New England neighbor from Needham. Simple recipe and the kids love fish this way. Incidentally, Ritz crackers were first made in Philadelphia- I am a Philly girl! I have to admit, I crumbled a few Ritz into the wheat bread crumbs. I couldn’t resist! OMG I need to try that asap. Thanks for the tip! I grew up in Westwood…my Dad built Pederzini Dr in Medfield! My Dad uses a mix of half Ritz crackers and half cheese-it’s and spreads mayo on the fish first. Yummy! That sounds AMAZING! I have to try that mayo thing sometime.